Last evening (May 27), I attended another performance of the Kitchener Waterloo Teachers Choir. My son and daughter-in-law are members of this amateur choir. Each Christmas and Spring they give a concert. This year’s Spring Concert included the song, “Kicking Horse River”. The lyric of this song is based on a poem of the same name by the Canadian poet Pauline Johnson. The music is composed by Jeff Smallman. This song is strongly evocative of the power and personality of the Kicking Horse River as it cuts its way through the Canadian Rockies. The music and words “grabbed me” and tugged at the heart of a man who loves the mountains of British Columbia and the wild rivers that emanate from their glaciers and a myriad of springs on high. The words of the immortal Pauline Johnson, mated with Smallman’s composition, and the sounds of the human voice, conjured up the Taoist ideas related to the power and qualities of water, sometimes known as the Water Way. – Water is relentless. It never stops exerting its force. – Its force is a manifestation of its nature. It does not try to be something it is not, applying neither morality nor immorality. – When it is restricted, Water seeks the weakest spot of any obstruction and applies constant force until it is free. – When it is pressed or attacked, it changes form and repositions itself. It exerts constant counter force to search for weakness. – Water is opportunistic. Given the slightest opening it will pass through. It will do so while the opening is present. It will widen the opening if possible. – Water always seeks to do the easiest thing as long as it can. -Water does not complain about the path it follows. It simply follows the path. – Water has a wide range of energetic expressions but continues to be Water. It can be still. It can be sluggish. It can be swift. It can be pounding. It can be vapor. When you compare the words and feelings expressed in Johnson’s poem to the qualities of water, the similarities are striking. Pauline Johnson was no Taoist, but she was a First Nation’s person who lived in the late 19th Century and on into the beginning of the 20th.. The First Nation traditional view of the natural world is very close to the Taoist concept of the unity of man and nature. The Way of Water and the Unity of Man and Nature, are two significant themes found in Through a Lens of Emptiness: Reflections on Life, Longevity and Contentment. Water plays an important role in all lives as an essential basic need. Beyond that, when the Way of Water in all its manifestations and qualities, becomes part of one’s way of living, he cannot help but seek the Tao. I look for evidence of the Tao in all peoples, in all cultures, and in all things. Of course, I do not always find it, but that’s not surprising. Sometimes you just cannot see the Tao (which cannot be seen), but one can always feel the Tao when he is on the right path. There are times when one is so moved by an experience, sharing it with others is the only thing he can do. 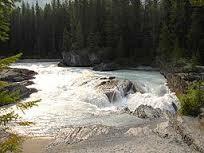 The rendition of “Kicking Horse River”, and the words of Pauline Johnson created just such an experience for me. Have you had a similar experience. Please share it through the comment section.